Steer by the middle telltales. When you are steering by the telltales on the luff of the jib, try to use the ones that are about halfway up the sail. These might be a bit harder to see (compared to telltales that are lower), but they will give you a more accurate reading for the whole sail than telltales closer to the top or bottom of the sail. Move foreword and outboard to see the middle telltales more clearly. Before moving your tiller or wheel to turn the boat, use weight placement to steer by changing the boat’s heel angle. If you want to turn left, move your weight to the right so you heel the boat to starboard. When you want to turn right, move left. This works best in lighter air and with smaller boats, but it will help to some extent in all boats and in any condition. When sailing upwind, it’s good to have a bit of windward helm to give the rudder more feel and lift. But on a run or reach an off-center rudder just creates drag, and this is slow. Therefore, adjust the trim of your boat and sails to keep your rudder centered and your helm neutral as much as possible. The boat should almost steer itself in a straight line. When you’re running in windy and/or wavy conditions, the best way to stay in control and going fast is to steer your boat under the rig and sails. If your boat heels to leeward, bear off to get the hull under your mast. If your boat heels to windward, head up. The idea is to keep your mast roughly vertical by steering your boat so the bottom of the mast stays under the top. It’s like trying to balance a long stick vertically with one end in the palm of your hand. 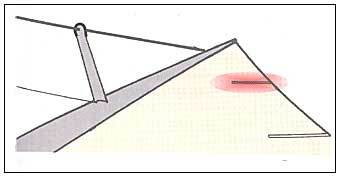 If you have a symmetrical spinnaker, an easy guide is to aim your bow at the center of the sail’s foot (where there is often a vertical seem). Always use sails for turning. Turning the rudder always makes you slower, so any time you want to turn your boat you should use sail trim to help as much as possible. When you wish to head up, trim your mainsail tighter (and ease the jib a little); when you want to bear off, ease your mainsheet (and trim your jib). This is especially important in heavy air when turning the rudder and moving crew weight from side to side are less effective methods of turning. If you’ve ever tried to bear off behind a starboard tacker without easing the mainsheet you know that sail trim has a huge impact on where the boat goes. When sailing upwind, it’s hard to keep your boat in the groove all the time. As soon as conditions change (e.g. you hit a wave or lull), most sailors lose their groove at least for a little while. That’s why it’s often good to set up the boat so it has a wide groove, especially in tough conditions like shifty wind and chop. 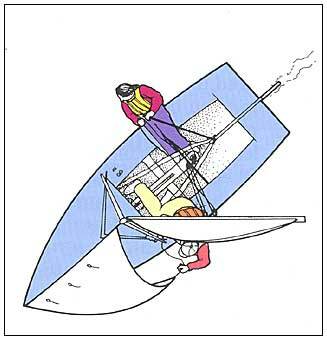 Ways to do this include twisting the sails, easing sheets slightly, making sails fuller, moving draft forward (especially in the headsail), heeling a little more, footing slightly and so on. This will make the boat more forgiving and easier to steer fast. Conventional wisdom says you should round a mark by swinging wide on the near side and close on the far side (like the red boat below). However, this is not the fastest way to get around the mark. Unless you are worried about your position relative to other boats, it’s better to approach the mark closer on the near side, pass it on a beam reach, and end up farther from the mark as you turn up closehauled (like the blue boat). The key is making your turn so the mark is at the bottom of your arc; if you don’t do this you will sail extra distance. Of course, there may be tactical reasons (e.g. boats just ahead or behind) why it makes sense to round wide and tight so you are on a closehauled course when you pass the mark. Set up for the lulls. When the wind is puffy, it’s impossible to set your sails correctly for all different velocities you will see. If your sails are too full, you’ll be too slow in the puffs, but if they’re too flat then you will struggle in the lulls. The best choice is usually to err on the side of tuning for the lulls. That’s because it is relatively easy to go fast in puffs, and you can live with being overpowered temporarily. But in the lulls you need lots of power if you don’t have it you will struggle to keep up with your competition. Getting the right main trim is critical for good speed in any condition. If you overtrim the main, it will stall and be slow. If you undertrim the main, you’ll be faster but you won’t be able to point. The key is finding a happy medium that works for both speed and pointing. The easiest guideline is trimming the sheet so the top batten is parallel with the boom. In light air and lump, let the top batten angle off to leeward a bit. In flat water and more wind, trim the sheet hard enough so the top batten angles to windward. 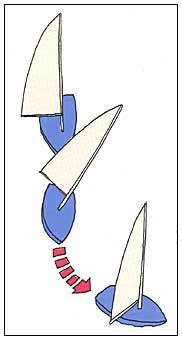 The wind is always changing so if you want to go fast you must constantly adjust the trim of your boat and sails. Therefore (if possible) don’t cleat your mainsheet! This line is also the best way to feel your boat’s pulse. Cleating it would be like turning on cruise control in a car race. Of course, when it’s windy the helmsperson may need help holding the sheet, or you may have to put it around a winch. Just try not to use a cleat. When flying a spinnaker (either asymmetric or symmetrical), it’s slow to overtrim the sheet. To make sure the chute rotates foreword as far as possible, keep easing your sheet until you see a slight along the luff of the spinnaker. Though this means you give up a small amount of sail area, it’s usually much faster to have the sail eased all the way with a small curl than to get rid of the curl but risk having the sail overtrimmed some of the time. When you’re going fast trim harder. When your boat feels good (like it’s going fast through the water), trim the main a little harder and point the bow slightly higher. 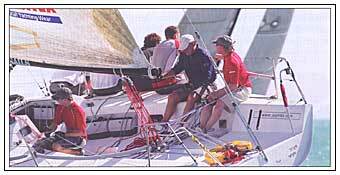 If the boat feels bad or starts to slow down, ease the mainsheet a bit and bear off. Once you are going fast again, start trimming again. This is a never-ending cycle. Try to keep trimming the mainsheet harder to help pointing, but when this makes you go slower ease the sheet for speed. Judge trim by speed, not by looks. When trimming your sails, the goal is to make your boat go as fast as possible. It’s nice when the sails look beautiful too, but this is not your objective. The key is to trim for performance, not appearance. The way the sails look is just a guide that may help you go fast. So don’t be too rigid about what you’re looking for. 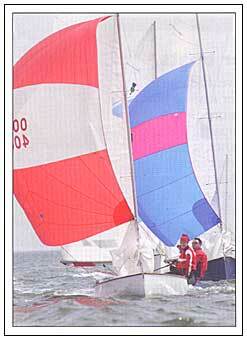 Sail shape is a means to an end - what really matters is how well you perform relative to other boats. Go fast at the start. 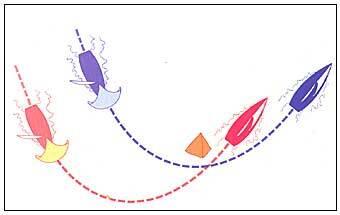 When do you expect the wind velocity to change after the start, how should you set up your sails? Your number one priority should be to optimize your sail trim for the wind you will have during the first few minutes after the start. When you come off the line, you want your boat to be as fast as possible so you can pop out ahead of the pack. If the wind does change later in the leg or race, it’s much better to be leading the fleet with a wrong set-up than back in the pack with a perfect sail trim.